Natural Hat Trick Productions: Naslund Retirement Official. . . 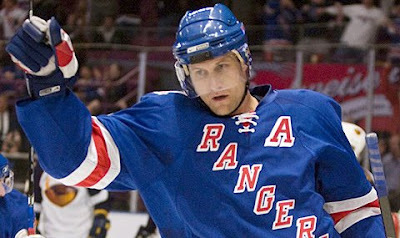 It just appeared on newyorkrangers.com, so the news of Markus Naslund's retirement is official. "I would like to sincerely thank Glen Sather and the New York Rangers for giving me the opportunity this past season in New York," said Naslund. "I would also like to thank the Vancouver Canucks and all of their fans for their support over the 11-plus seasons I was a part of their organization, as well as to the Pittsburgh Penguins where I began my NHL career." If you want to read what I already said on this, please click here. At this point, there is nothing left to say but thank you. Thank you to Markus Naslund for his wonderful 15-year-career. He has joined a list of prominent hockey players who have played for and ended their career as a member of the New York Rangers.